Short Trachten Lederhosen Fesl in Antique Brown. The high-quality Fesl Trachten Lederhosen are made from soft, weathered leather in a subtle shade of antique brown. 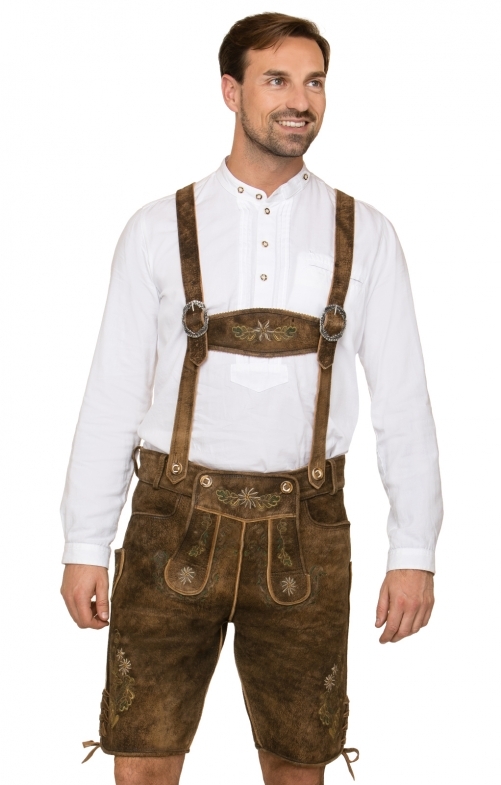 Fesl Lederhosen are supplied with detachable and adjustable braces in the classic H-shape but belt loops are also provided for a different look. These Lederhosen are lavishly embroidered with edelweiss flowers and other traditional motifs in tones of green, gold and white. Horn buttons accentuate the front flap and waistband and soft leather ties are used to adjust the back waist and to add detail to the hems. Perfect for an everyday rustic look or to impress at the Oktoberfest!